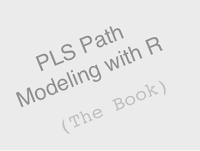 Gaston Sanchez has just published an online pdf of his new book PLS Path Modeling with R.
I have been using Gaston’s plspm r package for a couple of years to analyze marketing data. I started when I needed to test a path model in which one of the latent variables was a formative measure with far too many sparse indicators. Since then, I have used plspm to fit hierarchical models and compare different groups with small sample sizes. The package is easy to use with excellent documentation. However, the literature on Partial Least Squares Path Modeling (PLS-PM) desperately needs a more tutorial text like Gaston’s book. I call it a comprehensive tutorial because it is both comprehensive and instructional. Gaston shows you step-by-step how to setup the R code to run plspm and interpret the resulting output. But there is a good deal of substance in his treatment. He takes you through the reflective-formative measurement distinction (which is not an easy task) and shows you in some detail the algorithm that is used to estimate the model parameters (also not a simple undertaking). Then he provides an entire chapter to step you through the complexities of a specific example using customer satisfaction data, which is the best known example of a PLS-PM. All of this is in the first five chapters of Part I. Part II covers special topics: comparing groups, moderating effects, hierarchical modeling, finite mixtures, and a very enjoyable and helpful historical account. Although these special topics are handled using PLS, the issues raised are important to all modeling and are worth learning about even if you never use plspm. Gaston borrows a Spanish saying to describe R, “bueno, bonito y barato” (good, beautiful and cheap). It is also a good description of his book. The R community depends on individual researchers to share freely their very best work. Thank you Gaston.